Easy to use � Application is fast, and easy to teach and learn. 3M Coban 2 Compression System provides high compression (35�40 mmHg) for patients with ABPI greater than or equal to 0.8, and 3M Coban 2 Lite compression system provides lite compression (25-30 mmHg) for patients with ABPI greater than or equal to 0.5. 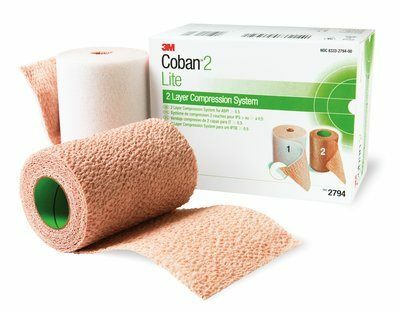 Coban 2 Layer is indicated for the treatment of venous leg ulcers, lymphedema and other conditions. Each system is supplied as a kit that includes two rolls: a Comfort Layer and a Compression Layer.